A recent study published in the journal Blood evaluated iron supplementation and how it may be less effective when given in brief intervals. Iron deficiency is the most common cause of anemia and it affects about one-third of the world’s population. Nearly 10% of female Americans between the ages of 12 and 49 are affected. 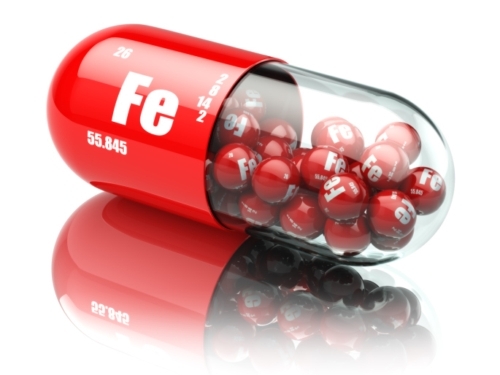 The first line of defense to minimize risks associated with anemia is for doctors to prescribe iron supplements. Unfortunately, the side effects of these tablets include abdominal discomfort, nausea, and constipation, which result in poor compliance in the long-term. Iron absorption from supplements is generally low, ranging from only two percent to less than 30% depending on whether they are taken on an empty stomach. Absorption is increased when consumed without food; however, this rarely occurs because the supplements can be quite harsh on the stomach. Increasing the dosage is not an ideal option though, as studies have demonstrated this could lead to inflammation and negatively alter gut microbiomes. A protein called hepcidin regulates iron absorption. When iron levels and inflammation are high, hepcidin levels rise, causing the amount of iron in the blood to drop. The increased hepcidin levels cause the iron molecules to be trapped, which results in decreased iron absorption in the gut. Therefore, when taking iron supplements, the liver produces hepcidin. It is released into the bloodstream where it reaches the gut and regulates iron absorption. Iron regulation has caused researchers to be concerned with people who split up their iron supplementation throughout the day. When taking a partial dosage in the morning, the hepcidin levels will increase, which may affect the iron absorption later in the day when the second dosage is consumed. As a result, researchers from the Swiss Federal Institute of Technology set out to investigate to what extent hepcidin levels affect iron absorption as a result of the high load of iron intake. They measured the effects that iron supplements had on hepcidin, iron absorption, and iron status biomarkers over several consecutive days. The study involved 54 non-anemic healthy women between the ages of 18 and 45. For two weeks prior to the study, participants refrained from taking any supplements. There were three types of studies. For the first two studies, the first day was a control day where participants did not receive any supplements. The first study was a crossover design where participants received varying levels of iron supplements ranging from 40 to 240 milligrams (mg) in either a single dose or two doses for two consecutive days. For the second study, participants received two single doses of 60 mg each for two consecutive days. For the third study, participants received 60 mg of iron, twice a day over a 24-hour period (three doses in total). Researchers measured the increases in hepcidin concentrations and how this affected overall iron absorption. Findings revealed that although hepcidin reached its peak concentration between six to eight hours after supplementation, the levels were still high enough the next day, affecting iron absorption. Therefore, even the second dose of iron was not readily absorbed although participants took it later that day or the next day. Study results revealed that taking supplements at higher doses on consecutive days increases levels of hepcidin and decreases the body’s ability to absorb iron efficiently for up to 24 hours. Taking supplements multiple times a day was even less efficient. In order to maximize the body’s ability to absorb iron, patients should take supplements at lower doses on alternate days. However, further research is necessary to study the long-term effects of this dosing method. “Iron supplementation: When less is really more,” ScienceDaily web site, November 6, 2015; www.sciencedaily.com/releases/2015/11/151106062318.htm. Moretti, D., “Oral iron supplements increase hepcidin and decrease iron absorption from daily or twice-daily doses in iron-depleted young women,” Blood 2015; 126(17): 1981, doi: 10.1182/blood-2015-05-642223.